I shall be bringing my beach umbrella! I don't think the folks of the Travel Destinations campsite will be very happy with this. I'm not suggesting that is how the final solution will look. I think they will push it back slightly. This picture shows what room they've got to play with. I think they could push it all back, cutting into the bank to make a fresh access road. They will probably also want to push back that far barrier, the one Tor Graves kept tagging this year. This corner never really struck me as one of the more dangerous parts of the track. But we've seen decent hits from the Pescarolo ('11), #95 Am Aston ('12) and Toyota ('13) in the last three years. I too have had several offs there........... on an awful driving game several years ago that shall remain nameless. The actual camping bit of the travel dest campsite doesn't push to the road, I imagine they could squeeze the access and car bit and push the bank back a bit then extend without losing camping space. Either that or put them into the enclosure on the other side of the road. We shouldn't forget that the ACO has a history of overdoing things on the safety issue's. They've managed to take away quite some great spectating spots during the last twenty years. I agree with everything Tom says. 100%. Echo Andrew's comments. 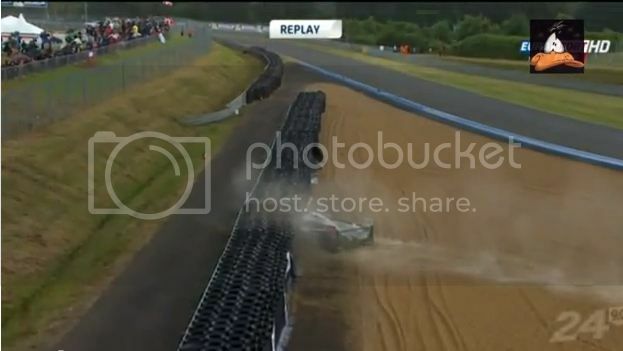 Le Mans is Le Mans for a reason. We all get goose bumps when we drive around the bits we can, and seeing spectacular cars doing incredible things around this track, if we're honest, resonates more than seeing them do the same incredible stuff around Silverstone or Shanghai. If they went ahead and made every change that was deemed 'correct' Le Mans would lose its aura quicker than an R18 can lap it. Not saying I wish that to happen, just that I fear it will happen with FIA influence and all that. Blimey, now I nearly said it!